The Pilgrims landed on the shores of America on a cold November day in 1620. They set anchor at what is now Provincetown, in Cape Cod, across the bay from Plymouth Rock. 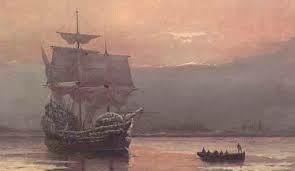 Their first act upon reaching the New World was to draft and ratify the Mayflower Compact. At sunrise, on November 11th, 1620, forty-one men signed the document that would set the course for democracy in America. A small group of Pilgrims then stepped onto the beach to explore their new homeland. As the party entered the dark forest above the beach, they stumbled into the village of the Nauset Indians. The village was empty. The Nausets were a powerful and populous tribe. They spent their winters far inland, where the hunting was better, and returned to the coast with warm weather to plant their summer gardens. As the Pilgrims investigated the deserted village, they found a smooth place in the sand where something had been carefully buried. They dug down and discovered a secret cache of Indian flint corn with kernels of red, yellow, and blue. The Nausets had buried this corn in wicker baskets to preserve it through the winter. This was the seed stock for their summer gardens. There were four bushels of corn in that stockpile. Two men could barely lift it from the ground. The Pilgrims carried the corn back to the Mayflower and returned a few days later looking for more. In all, the Pilgrims took fourteen bushels of buried corn from the Nauset Indians. Then they sailed across the bay to start their colony at Plymouth Rock. The Pilgrims took the corn because they were desperate. They were now stranded in a desolate wilderness, winter was upon them, and they were nearly out of supplies. They didn’t know if the barley and pea seeds they brought from back home would grow in the rocky soil of New England. They believed the corn could make the difference between life and death in the New World. The Pilgrims vowed on their honor to reimburse the Nausets as soon as possible. The place where they found the corn and made this promise is known to this day as Corn Hill. It was lucky for the Pilgrims that the Nausets were away at their winter hunting ground, because the Nausets hated Englishmen. Six years before, in 1614, an Englishman named Thomas Hunt had abducted a large group of Indians from New England, including twenty Nausets, to sell into slavery. If the Nausets had been home when the Pilgrims walked into their village, the history of America may have taken a decidedly different course. 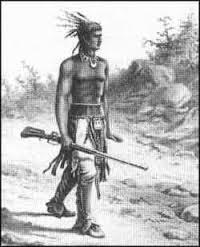 One of the Indians abducted in 1614 by Thomas Hunt was the legendary Squanto. Squanto had somehow escaped slavery and lived for a time in England before finding his way back to America on a merchant trading vessel. Squanto became a great friend to the Pilgrims. He served as translator and helped broker an alliance with the powerful chief Massasoit. Squanto also taught the Pilgrims how to plant the corn they had taken from the Nausets. In fact, the First Thanksgiving was celebrated with the successful harvest of the Nauset corn. The Pilgrims soon fulfilled their promise to reimburse the Nausets. They sailed back across the bay and traded fairly with the Nauset chief, Aspinet, and formed a lasting friendship with the Nauset Indians. Word spread among the tribes of New England that the Pilgrims had righted the wrong they committed in their first desperate days in America. The Pilgrims had demonstrated a remarkable toughness in their survival on the beach, and now they proved to be honorable and honest people. They paid for the corn because they believed was the right thing to do, but it also turned out to be good diplomacy. 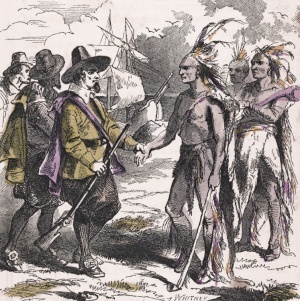 The fair dealings of the Pilgrims led to fifty years of peace with the Native Americans of New England. This peace allowed the Pilgrims, and the pioneers who followed them, to establish a foothold of freedom in America, and begin to build the democracy that would one day reach across the continent. Hello Francis, thank you so much for your comment! Unfortunately, for a long time, during the 1800’s and most of the 1900’s, historians generally treated the Europeans as the good guys and the Native Americans, if they were mentioned all, as the bad guys—or at best, as antagonists in the stories of the ‘white heroes’. That trend was completely reversed in the 1990’s. Now, whites are inevitably portrayed as bad people, usually with evil intentions, while Native Americans are the innocent victims of their depredations. The truth, of course, is more complicated—and more interesting. There were good and bad people on all sides, good and bad policies, good and bad outcomes. If you follow my site, you can probably tell that I am as interested in, and respectful of, Native American culture as in the Europeans who collided with them hundreds of years ago. It is all fascinating to me, and part of our heritage. The link you provided is mostly about whites stealing from the graves of Native Americans. There are some claims in there that I could not verify through other sources, specifically about the Pilgrims taking from a sachem’s grave site. I would not take every statement in that story on faith. But the article was correct about the Pilgrims digging into two Nauset gravesites on their first days on shore. The Pilgrims did not steal from these graves. They did not know what was buried there, and when they discovered what it was, they carefully replaced everything just as they found it. This was the first days of the Pilgrims in the New World, and they did not understand the culture and did not yet have a guide to explain things to them. Some of the buried places contained graves, while others contained food. The Pilgrims did, however, take the corn. Their vow to reimburse the Nausets did not necessarily put them on high moral ground. The Pilgrims have been bashed plenty of times for taking this corn. My view is more understanding. If it had been you and me on that cold desolate beach in 1620, with a dark unknown wilderness in front of us, low on supplies, with winter on top of us, would we have behaved differently, or better, than the Pilgrims? All I can say is that I am glad I don’t have 400 years of historians looking over my shoulder, judging my every action–and I am not facing nearly the challenges that were stacked in front of the Pilgrims. Or, to take another view, would other Native Americans at the time have tried to steal food or anything else from each other? 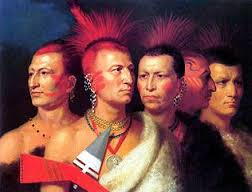 Native American tribes stole from each other, attacked each other, and went to war with each other all the time. America before the arrival of the Europeans was a place of politics and warfare, and as soon as the Pilgrims landed, they became a strategic instrument of the Indians in their quest for supremacy among other tribes. I gauge the situation based on the view of the Nausets; the people who were there at the time. The Pilgrims did indeed return to reimburse the Nausets. The Nausets not only forgave the Pilgrims, but were happy with the settlement, and they even became allies of the Pilgrims. Their friendship says a lot about what kind of people the Pilgrims were AND what kind of people the Nausets were. You say my version of events is “make-nice” about the Pilgrims, and you want a stronger flavoring of the truth. But the truth is that the Pilgrims were different than most of the other Europeans who landed in the New World, especially when you compare the behavior of the Pilgrims with the Conquistadors. In my article, I pointed out that slave trader Thomas Hunt poisoned relations by abducting Native Americans into slavery. Europeans gave us plenty of fodder for bashing them, and we can judge them harshly where appropriate, but we can also give credit where it is due. The Pilgrims were in the New World seeking nothing more than religious freedom, not riches or glory. The Native Americans of the day definitely viewed them as different from the other Europeans they encountered. It is okay for us to also recognize these differences. The Pilgrims and Native Americans enjoyed complete peace for fifty years. This was an unprecedented accomplishment in the history of exploration and colonization—in the Pilgrims’ time, or any other time. The leadership skills and good faith of Pokonoket sachem Massasoit and Pilgrim Governor William Bradford were truly extraordinary. It is fair to honor these folks for the good they did, and reserve our harsher judgments for the historical characters who deserve it. Thank you for that wonderful thanksgiving beginning. Now a days everything is so commercial and we forget the most important reason that we truly celebrated for. It also teaches integrity and honor which seems to be lacking in some of our younger generation. Am just discovering Captain Myles Standish (Mayflower) is a generational great-grandfather of mine, as well as Robert Wixam (John Wintrop fleet) married to either Alice Titus and/or Alice Aspinet (Chief Aspinet’s daughter). Thank you for your informative article on the Nauset, Cape Cod Indians.